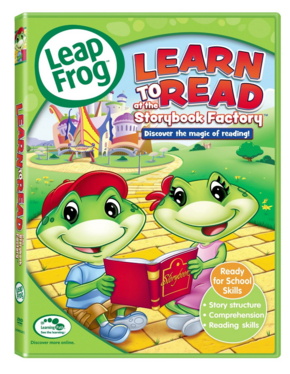 LeapFrog: Learn To Read At The Storybook Factory Just $5.11 Down From $15! You are here: Home / Great Deals / Amazon Deals / LeapFrog: Learn To Read At The Storybook Factory Just $5.11 Down From $15! Discover the magic of reading with LeapFrog: Learn To Read At The Storybook Factory for just $5.11 down from $15 on Amazon! Get yours now while it lasts! Deep inside the Storybook Factory – where pictures, words and imagination bring stories to life – Tad, Lily, Casey and Dot decide to put a few new twists on a classic tale. The result is a fun-filled adventure that turns reading into a delightful game! Special features include sing-along songs to help your little ones learn, complete with a string of read-along words that run across the screen.